It’s not too early to make ticket and hotel arrangements for Cubs spring training games. The Cubs have already announced their opening games in Arizona. First up, they play Milwaukee Brewers at Maryvale Park in Phoenix Feb. 23. The rest of that weekend they are playing Texas Rangers in Sloan Park Feb. 24 and the San Francisco Giants in Scottsdale Stadium, Feb. 25. The next week through March 1, the Cubs will be at home at Sloan against the Seattle Mariners Feb. 26, the Chicago White Sox, Feb. 27, Oakland Athletics Feb. 28 and Colorado Rockies Mar. 1. 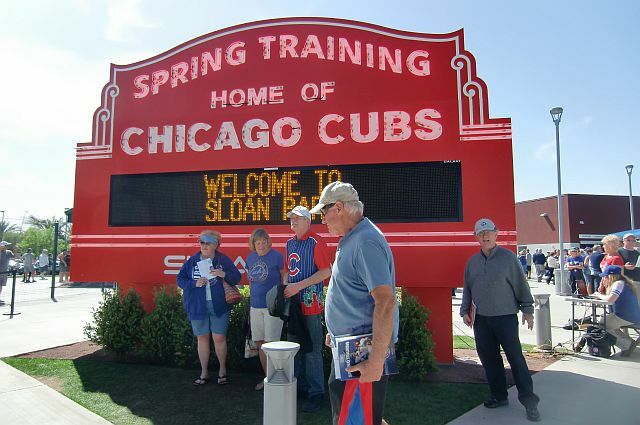 Even though the tickets are not yet on sale, the Cubs have a spring training waiting list. So best chance to get what you want is to sign up at MLB Sloan Spring. To be in the middle of the Cubs action, consider the Sheraton Mesa at Wrigleyville West that is right there, abutting Sloan Park. However, there are several good chain hotels and resorts near all the spring training ball parks. Plus there are lots of excellent golf courses, good shopping and outstanding museums that turn a spring training visit into a vacation. Check out Visit Mesa, Visit Phoenix and Experience Scottsdale and Sloan Park. Hey Cubs fans, tickets are on sale now for home games at Sloan Park in Mesa AZ. Here are some tips if you snag a ticket for the Cubs’ Wrigleyville West location (yes, that really is the park’s nickname) or to see the Cubs at another of the Cactus League parks. 1. No matter how you feel about the cost of ball-park programs do get the Cubs official Sloan Park Spring Training 2017 program. 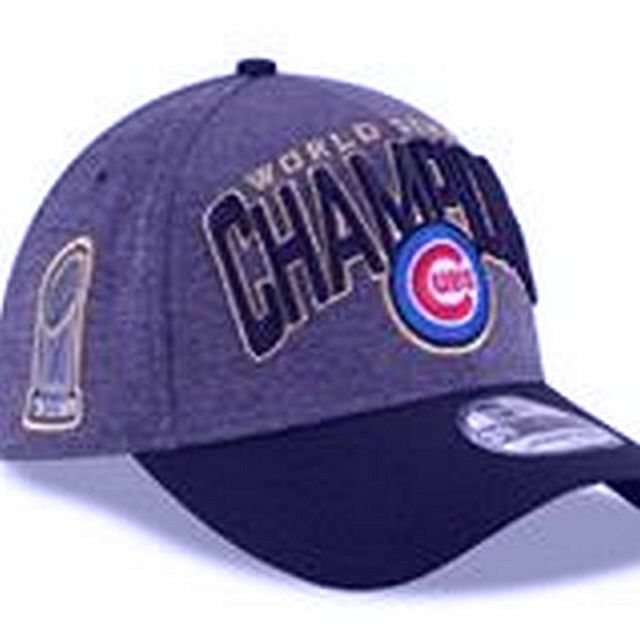 You might even want to get an extra one for a Cub fan back home who didn’t make the trip. It will have photos and good info on the Cubs players similar to baseball cards. In addition, it will have the rosters of other Cactus League teams so you will be able to tell who is or is not on the field when they play opponents. It will contain highlights from the 2016 Championship season and tell about player’s awards. The program will also suggest where to stand for autographs and buy Cubs items. It also mentions places to dine and things to do. 2. The first full-squad workout is Feb. 18. The first Cubs spring training game is Feb. 25 when a split squad will play the Oakland A’s in Sloan Park and the San Francisco Giants at Scottsdale Stadium. If going to the Scottsdale game check out the Western Spirit, downtown Scottsdale’s terrific Museum of the West. It features western paintings, sculptures and a collection of western gear from saddles and spurs to badges and rifles. 3. When going to Sloan Park, prove to your friends that it is Wrigleyville West by snapping shots of its abutting street signs: Waveland Avenue on the north, Sheffield Avenue on the east side and Clark Street on the west. The park also looks like a somewhat smaller version of Wrigley Field. However, the famed marquee is inside here. You can have a message light up on it or take a selfie in front of it. Sloan Park is at 2330 W. Rio Salado Pkwy, Mesa, 85201. 480-668-0500. When it takes more than a century to achieve a monumental goal the celebration has to attract millions of people, lots of speeches and selfies and photos for the album and social media. In other words, joyous crowds will carpet the parade route and rally. What you need to know is where to go and how. Chicago Cubs parade from Wrigley Field to Hutchinson Field in Grant Park. By now you probably heard or figured the fabulous 2016 World Championship Cubs will be coming downtown from Wrigley Field, today, Nov. 4, 2016. They start off at 10 a.m. and will end at Grant Park. But what you need to know is that there are designated viewing areas: ballpark, Magnificent Mile and Grant Park. Near the park it is Addison Street from Sheffield to Pine Grove Avenues. About 11 a.m. on the Mag Mile the parade is best viewed from Oak to Ohio Streets. At Grant Park it is Columbus Drive from Monroe to Balbo Drives. Between viewing areas the parade vehicles will be going faster. The rally celebration will be at Lower Hutchinson Field about noon. If you know Chicago, and there are thousands of fans in town from out of Illinois who don’t know that driving to the viewing areas and downtown is NOT a good idea even on a normal day, so you take the L and Metra trains. Buses are going but are rerouted. Metra is doing its weekend $5 ticket all day Nov. 4. Just know that no bikes and alcohol will be allowed. There are extra trains running but if full they may pass your station so wait for the next one. It may seem as if you have plenty of time but fans have already been gathering along the route so if not watching on TV, leave now, plan to celebrate downtown (the bars, restaurants and hotels are prepared for crowds, and return later. If you live in one of the states that felt winter’s arctic temps or wild winds or unpredicted floods (and that is most of the United States), you deserve a treat. So, don’t wait until you can actually escape to somewhere fun, interesting or colorful for Spring Break. Start planning now while the skies are grey or work impinges on sleep. Part of the fun of getting away is thinking about where to go and what to do when you get there. Here are some tips to help you decide but they require fairly quick action because spaces and tickets go quickly. Become familiar with cruise line deals. For example: Go to Princess to find half-price fares. The cruise line delivers what it promises. However, other cruise lines such as Norwegian also do last minute deals. The lines want to book their cabins and some of the destinations are perfect for a spring break. Tie your spring break with something you’d love to try or do such as expert cooking. 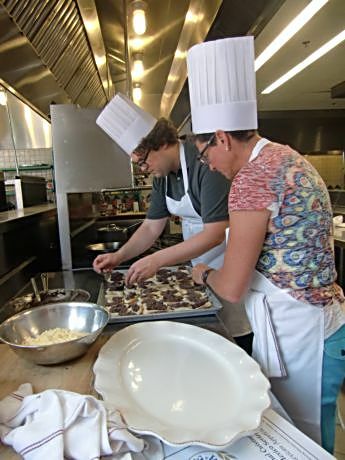 The CIA, not the spy organization, but the Culinary Institute of America, offers food enthusiast courses at its Hyde Park site in New York, its Napa site in California and its San Antonio site in Texas. The places are in interesting vacation destinations. Tie the spring break to a sport your family loves such as baseball’s spring training. Go to Major League Baseball for the schedule to see what ties in with your spring break. By baseball definitions these are warm vacation destinations. The Cactus League is in Arizona and the Grapefruit League is in Florida. Bonus tip: Have fun so don’t worry about what you can’t change.